Celebrating our busiest summer to date with Experience Works! As the summer holidays recently drew to a close, so too did our latest Experience Works; providing students from across the Tees Valley with the opportunity to gain experience and insight into a variety of industries in our region. This year saw some new additions to our most popular programme, with the introduction of new sector specific weeks covering a number of our industry members and some of Teesside’s thriving industries. Following on from the already established Experience Engineering, Experience Finance and London Law Experience, our all new Creative, Northern Law and Shipping & Logistics weeks have been introduced to provide an even more varied and wide-ranging programme offering. These new additions made it our busiest summer to date, with a record number of students connected to businesses in our region! Creative Week offers the chance for students to gain experience and insight within the fields of digital, PR, marketing, TV and radio. Such opportunities have traditionally been considered limited in Teesside, however over the past 10 years the area has seen significant growth thanks to the success of a number of digital start-ups and small-to-medium sized businesses. This year’s group consisted of students from SRC Bede Sixth Form, Prior Pursglove College and Hartlepool Sixth Form, with the programme kindly sponsored by PD Ports, Better Brand Agency and Gossip Magazine. The week started with a visit to Zetland FM, where presenter Julie Donaldson showed students around the studio and shared her top tips on entering the world of radio. This was followed by a trip to Digital City’s HQ at Teesside University, where broadcast skills were fine-tuned and put to the test for both TV and radio. Students then headed to Middlesbrough’s creative cluster of business, centred around the blossoming Boho zone. This digital and creative hub is home to a number of industry-leading businesses such as Ithica Films and Better Brand Agency. Students had the privilege of visiting both of these industry members, spending time learning about each business, their unique processes and taking part in creative workshops. The group then travelled over to Tees Dock, checking in at PD Ports’ Eustace House offices. The business’ PR and marketing team were on hand to discuss careers and opportunities, detailing specific roles and daily activities within a nationwide organisation. Students then headed north to Chester-le-Street to visit PBL Print, where fashion and lifestyle magazine, Gossip, is printed. Here, the group gained insight into the design and production of a regional magazine, as well as acquiring a handy goody bag. Northern Law Week is another scheme in its first year and follows our highly successful London Law Experience. This programme is specifically designed for students looking to pursue a career within law and those currently studying the subject at college. The busy and informing programme provided students from Stockton Sixth Form College, Conyers School, Prior Pursglove College and SRC Bede Sixth Form the chance to visit law businesses and institutions in the North East. 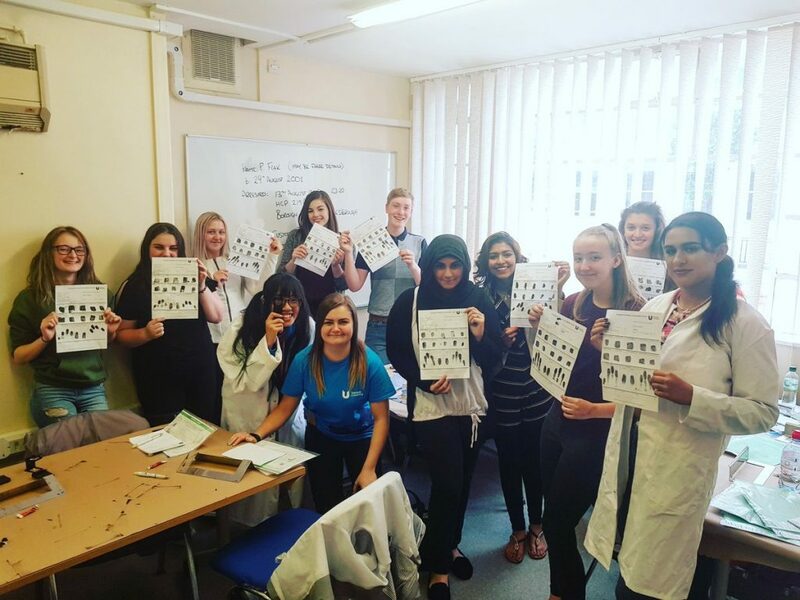 The week began with an exciting trip to Teesside University’s law, crime investigation and policing teams, where students got to grips with finger printing and policing techniques. The two day visit ended in a mock court room, with students working together to solve a detailed case. This was followed by a trip to Jacksons Law in Stockton. The group were tasked with putting all they’d learnt so far into practice by taking on some of the roles that could soon await them in their law career. A research project and quiz got the day off to a start, before tensions rose and debate enraged as students fought their corner as part of the defence and prosecution team in a mock murder case. Later in August, students from Stockton Sixth Form, Prior Pursglove College and SRC Bede Sixth Form boarded a train from Darlington and headed to the Big Smoke for London Law Experience. The three-day programme is one of our highest acclaimed schemes, providing the chance for students to travel to the capital and experience the fast-paced world of law and insurance. The busy trip started with a visit to the offices of intentional insurance firm Thomas Miller, before a tour of the historic Lloyd’s of London. Lloyd’s origins date back over 325 years, with the organisation being one of the world’s leading insurance specialists. The inspiring visit was topped off thanks to guest speaker Phil Parry from Spinnaker Global. 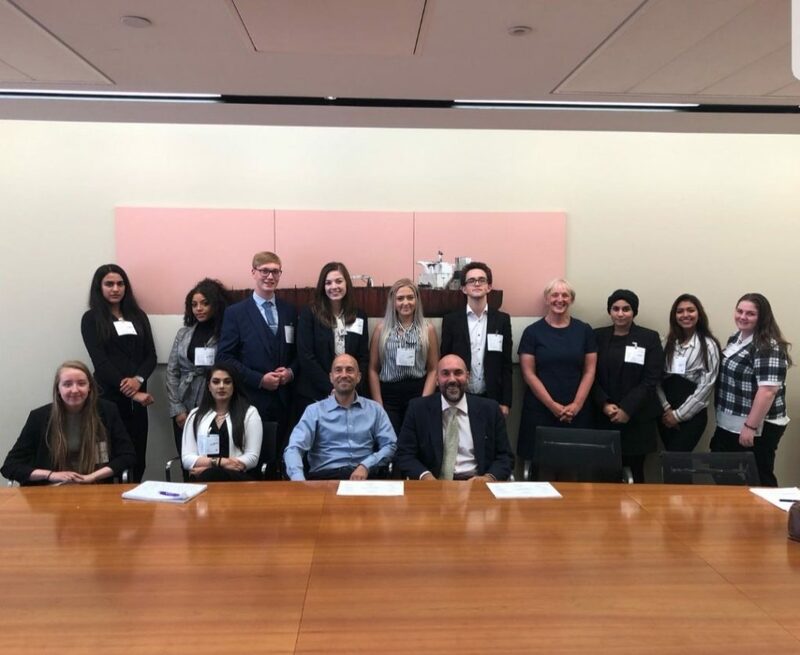 Students were then offered the incredible opportunity to take a look behind the scenes of Clifford Chance; one of five law firms within the Magic Circle. Their experienced team of associates were on hand to deliver interactive activities, as well as offer advice and tips for getting a head start in the world of law. The once in a lifetime trip finished with a visit to programme sponsor, Clyde & Co; a superyacht law specialist with associates and partners across the globe. 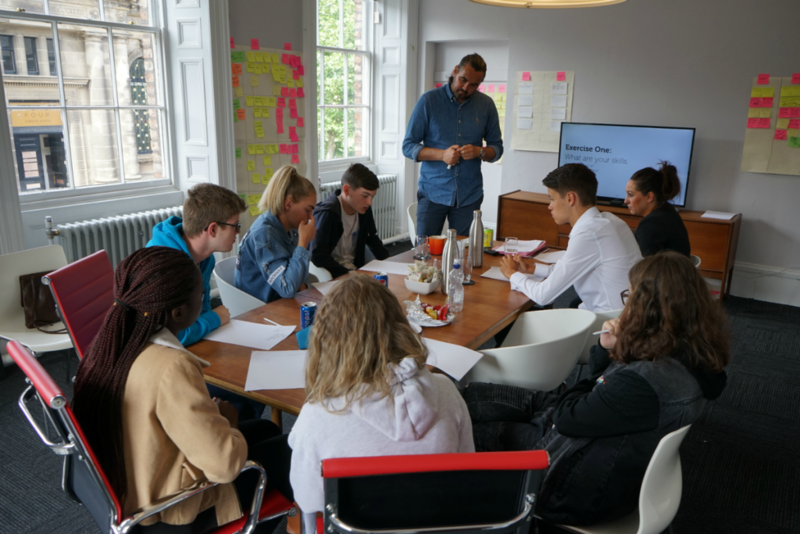 Clyde & Co have hosted our group visits for the past two years, providing tours of their central London offices and offering insight and inspiration for Teesside students. Many of our young people have never had the chance to visit the capital before, and some not even experience the working world of law, but thanks to programme sponsors, Clyde & Co, they can now take part in this life changing opportunity. Closer to home, and Finance Week was about to get underway for the second year. 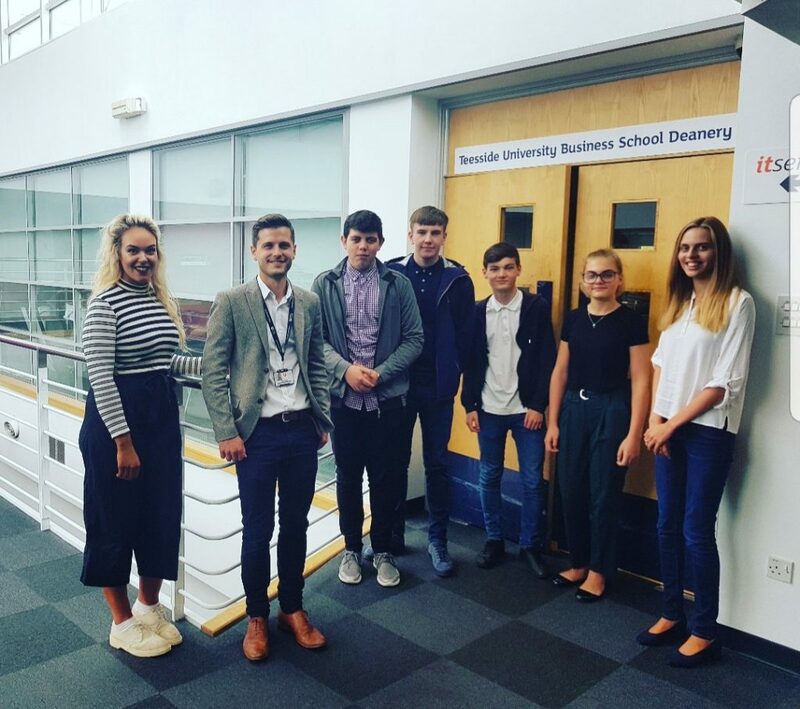 This took students to Teesside University’s Business School with a talk from Senior Lecturer in Accounting, Jonny Munby. The visit allowed students to further understand careers in finance and how best to study for particular roles. Students then went on to visit Anderson Barrowcliff, Active Financial Planners, Handelsbanken, PD Ports and new industry members, Joslin Rhodes. Each offered invaluable insight into their business, while providing the opportunity for students to network with key local companies and gain careers knowledge for a variety of roles. A special thank you to Active Financial Planners for sponsoring this year’s programme and their continued support. Without such industry members we wouldn’t be able to deliver the programmes we do and change the lives of young people in the Tees Valley. Engineering Week took place early in the summer holidays, with students from English Martyrs School, Prior Pursglove College, Stockton Sixth Form, Laurence Jackson School and KTS Academy. The week-long experience is specifically designed for those with an interest in engineering, with this year’s programme starting at Wilton Engineering where CEO Bill Scott offered insight into the River Tees based business. The second day saw the group head to Wilton International, with an eye opening tour by Sembcorp followed by an informative session with global chemicals company, SABIC. Visits to Lotte Chemical, EDF Energy and JDR Cables were next on the agenda, with the latter offering insight into the renewable energy sector and its careers available on Teesside. A visit to offshore wind specialists MPI Offshore followed, with former High Tide student Rachel Boynton helping to run the session. Rachel took part in Engineering Week in 2016, where she was introduced to the engineering sector in the Tees Valley and its range of businesses. Just a year later she gained an apprenticeship with one of those companies, MPI Offshore. It was great to see Rachel continuing her career, and it was particularly rewarding seeing her inspire the next generation of Teesside’s engineering workforce! Engineering Week was the first sector-specific week created, and now in its third year it hosts the largest number of students. UK Steel Enterprise were kind enough to sponsor this year’s programme, with such support helping us to continue offering opportunities and experiences to budding young engineers in our region. The company are the regeneration subsidiary of Tata Steel, who are also industry members and regularly support the foundation. Shipping & Logistics Week was another newly established programme, taking inspiration from the fully fledged Shipping Cadetship. 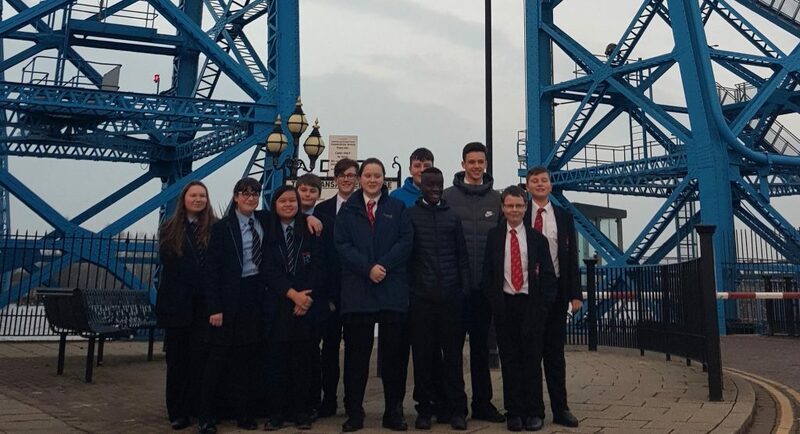 Students spent the first day rotating around the various departments of PD Ports, including being introduced to the bulk terminal, meeting the harbour police and visiting the harbour office to understand the running and management of the River Tees. 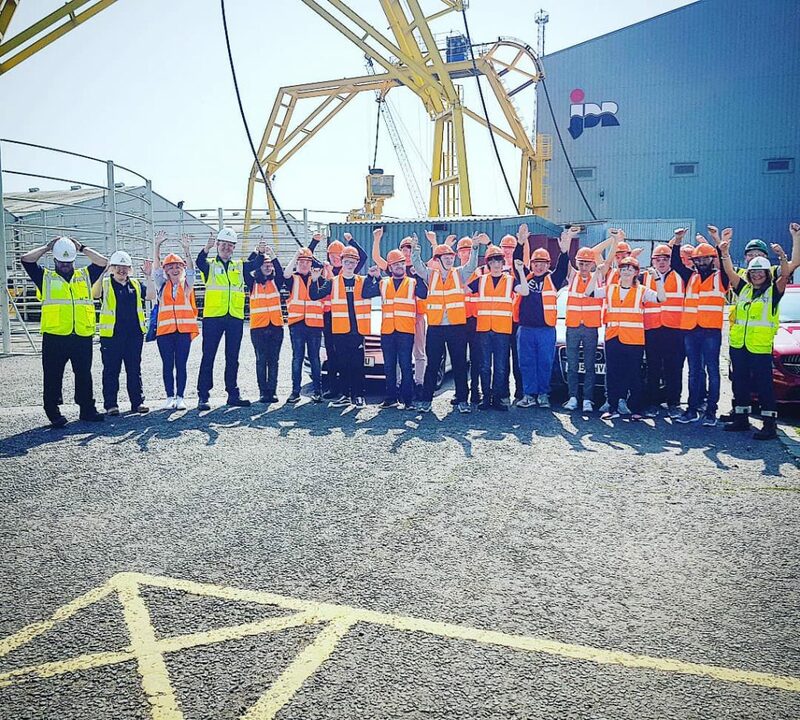 Students then went on to visit industry members LV Shipping, Casper Shipping, Bulkhaul and Clipper Logistics; all introducing students to their companies and offerings. Each business also outlined their tips and advice for entering the industry, as well as detailing the different roles available. A massive thank you to our industry members, education members and partners who made all of this summer’s programmes and opportunities possible. Without your support and commitment we couldn’t continue to showcase the region’s industries, while changing the lives of young people and inspiring the future of the Tees Valley. A special thank you to Coatham Coaches and PD Ports for generously providing transport support over the summer too. If you’d like to be involved with High Tide, our programmes and raising aspirations for young people in the Tees Valley please get in touch. We’re always looking to add to our industry members, so if you can help in any way no matter how large or small, drop us a message or give us a call.